It goes on. It never stop. Life. Every moment a change. Ever so gradual, ever so slight. Ask oneself, am I any different from what I was a minute back? an hour? a day? a week? a month? an year? two years? 5 years? 10 years?… Some where in this spectrum of time the answer changes from a no to a yes. We change, everyone does. But with that change most often is lost what changed. What remains is just the change. The present. What also remains is the future. The desired change. Dig out an old album, flip the pages. Read through those old scribbles, smile at the thoughts. Have those thought bubbles pop above your head… Always fun and funny to look back and see oneself. Its like looking in a mirror, only that the mirror is not a regular one. Its one of those distorted mirrors we once used to laugh looking at in carnivals. Some distortions we liked, some we abhorred. Its the same feeling. Looking back the distorted mirror of time. Sometimes it feels like what has become of oneself, sometimes its hard to believe I could have ever been that. 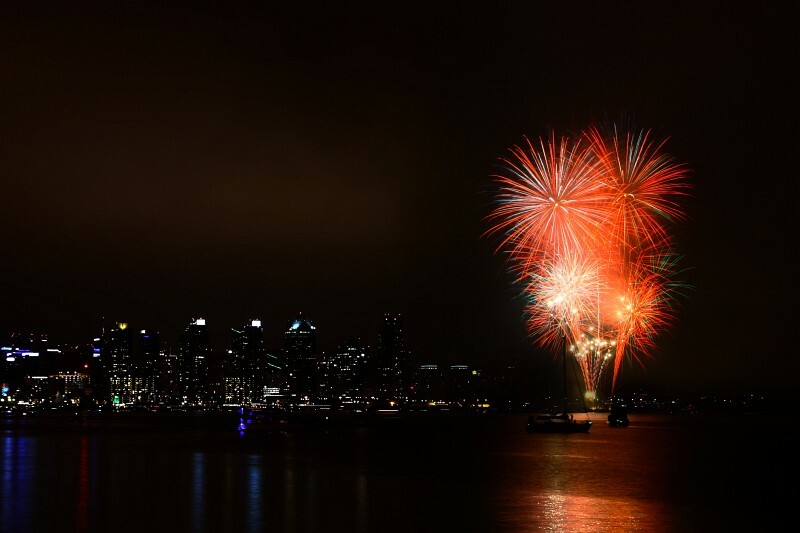 Collection of photos from July 4th Fireworks in San Diego Downtown. A view of the downtown from Harbor Island. Couple of my favorite fireworks shots. Was lucky to have the boats right in the field of view.